Club Penguin Cheats by Mimo777 Club Penguin Cheats by Mimo777: Her Majesty Chattabox Invites You to a Royal Gathering! Her Majesty Chattabox Invites You to a Royal Gathering! G'Day Penguins! Thanks for coming to celebrate my birthday with me at last week's party! I had the BEST time! 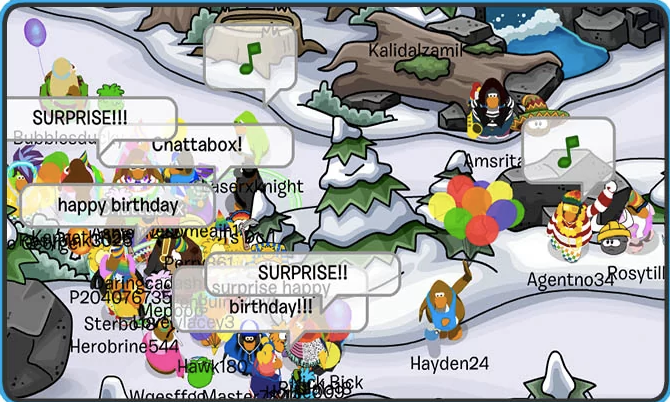 There were so many party hats and balloons - it was crazy! Did you know that this week is the Queen's birthday? We get a whole day off of work and school just to celebrate! I think we should celebrate this special day in style - by holding a Royals party! Come along to my iggy in your fanciest royal outfits and let's have a party fit for a queen... THE Queen! * 7am on Thursday 12th June for my pals in the UK. Saweet! Do you thin you will make it?